Gill Tasker is a PhD student at the University of Strathclyde, Glasgow, researching the life and writing of Alexander Trocchi. She has worked in the music industry, including interning in NYC and at BBC Radio 1, and has been published twice in Taiwan. 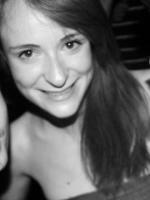 She is also the Editor-in-Chief of the Glasgow-based publishing house Cargo. A look at a neglected but influential Scottish junkie, novelist, poet and innovator.